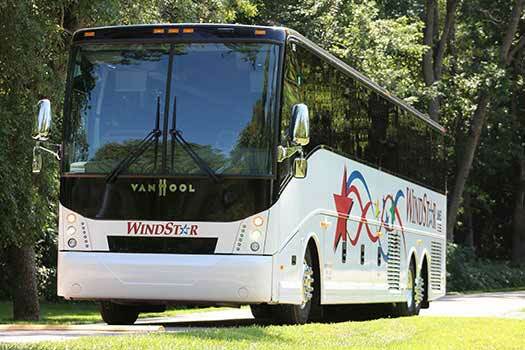 Windstar Lines is the go-to for Quad City charter bus rentals. With a long history of providing quality ground transportation, Windstar Lines offers special event travel options as well as convention travel. Our professional drivers are familiar with the area and will offer you the safest and most reliable way to travel. This large metropolitan area shared by Illinois and Iowa is right in the heart of the Midwest along the banks of the Mississippi River. This area is full of tourist attractions and also the hub for major corporations like John Deere & Company. If you are looking to travel to or from the Quad Cities, we can help you get where you want to go. If you are planning a trip with a large group of people you might want to consider a motorcoach or bus rental from Windstar Lines. We offer a variety of motorcoach and bus rentals, from a 21 passenger minibus all the way up to a 56 passenger coach, all of which will exceed your expectations in comfort and amenities. Maybe you and a group are flying in for the weekend and need transportation. We can arrange to have one of our motorcoaches waiting for you at the airport. So when traveling to or from the Quad Cities you can do it in style, comfort, and luxury with Windstar Lines’ motorcoach and bus rentals. Call us today to get a free quote on your next trip and get going on your next dream trip with the professionals at Windstar Lines. Our standard luxury motorcoaches boast high back reclining seats, full cabin climate controls and individual climate controls, overhead storage flat screen monitors with DVD and more. We also have handicap lift equipment available upon request.